Back in the depths of January I booked my now annual adventure to the National Association of Broadcasters convention in Las Vegas. Now I know what you're thinking, jolly, right? Well I'm not going to pretend that their isn't any socialising involved but these trips make more of a difference to my work than any camera, software or computer ever can. 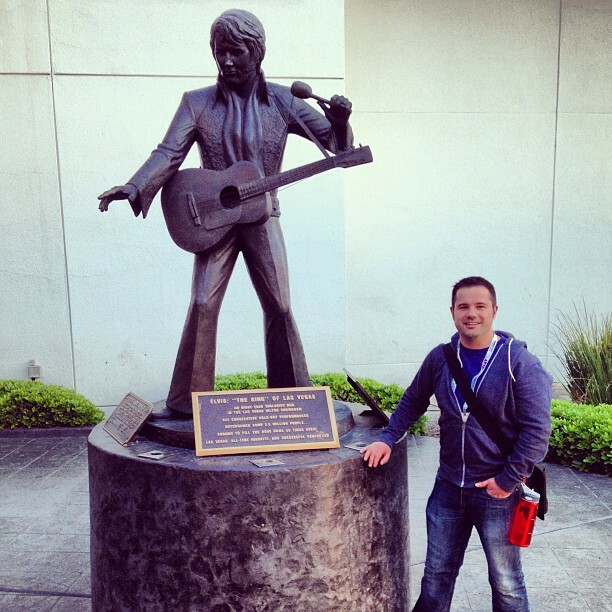 Ben Barden and Elvis Presley, together at last! The 1st time I went, I went alone to do the Post/Production world training programme. This is 6 days of intense training in editing, colour grading, production and post audio, lighting, interview technique and documentary producing and editing from the very best in the business, Hollywood decamps to Nevada for the week. After learning so much the 1st time round I had to go back. This year I've concentrated on sound and colour. With corporate and short films, the quality of the audio seems often to be regarded as secondary to the images, but if you think about how much of your message needs to communicated through sound it really should be given equal consideration. I've always been conscious of this and made great efforts to be painstaking in my approach to it. In the NAB sessions I have massively expanded my knowlege and skills, especially for recording in less than perfect locations. This coupled with some excellent post production techniques means that the audio on all my video projects will be even better than ever. For years now I have shot all my stills exclusively in raw format, this gives me latitude to make major adjustments to the files in Photoshop or Lightroom. When I'm shooting I am constantly thinking about the information that can be extracted from the camera file to ensure I have captured enough data to produce the image I want at the end of the process. Every image that is delivered to clients goes through a conversion and retouching process to correct colour, contrast and noise as well as to give images a punchy and vibrant look. It's long been a source of frustration that I haven't had quite the same flexibility with video, as until very recently, cameras able to capture raw video weren't really available. That said I have always set my cameras to record in the flattest available picture profiles so I can make some corrections, indeed as with photography, every shot that makes it into an edit for a client is corrected and improved to some degree. We are now entering the raw video age, my FS700 will be unlocked by Sony later this month and that is so exciting, given that I will be able to do so much more I wanted to do some extra training on the industry standard DaVinci Resolve from Blackmagic Designs and Spedgrade from Adobe. These classes were intense and in a couple of days I really got to grips with the hugely diferent workflow from that used in stills post production. Being able to push the quality of work that I deliver to clients to whole new level is thrilling! At the end of long days intensive learning the evening product launches and networking events kick off. Over the last 2 years I have met masses of wonderful and inspiring people working both in Europe and the USA. This is leading to some great opportunities one of which has been the creation of the Going Postal podcast a radio panel show on post, production and pop-culture. 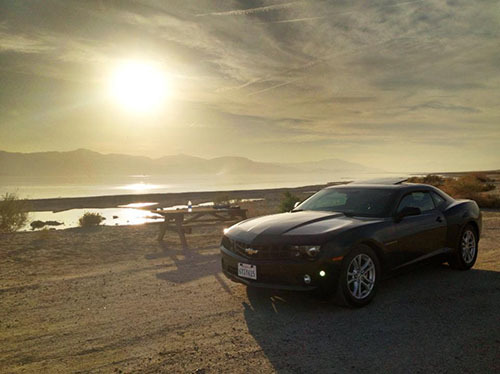 iphone shot of my beautiful Camero hire car at the Salton Sea whilst we were time-lapsing. After a solid week of all that I was exhausted, I escaped the mayhem of Vegas for a time-lapse expedition in the dessert before heading to LA for a meeting and flying home. I never tire of that landscape! The time-laspses will be posted shortly. Still think it was a jolly? Well maybe just a little.